Started planning for the Super Bowl already? You’re not alone. Whether you’re hosting a big party, hanging out with friends or watching from the comfort of your home, you want everything to be perfect on the big game day — including your Super Bowl snacks. If you’re looking for full flavor and festive food to get you all the way to the win, Premio’s lineup of touchdown Italian sausage recipes won’t disappoint. There’s nothing like a layered dip at kickoff — especially when it’s packed with real Italian chicken sausage. Start by sauteeing your chicken sausage in a pan over medium heat until fully cooked and browned on the outside. When finished, slice into 1/2-inch coins. Layer your dip in a glass dip dish, beginning with hummus spread. Top the hummus with the roasted red peppers, evenly lay out sausage coins over them and spread pesto on top. 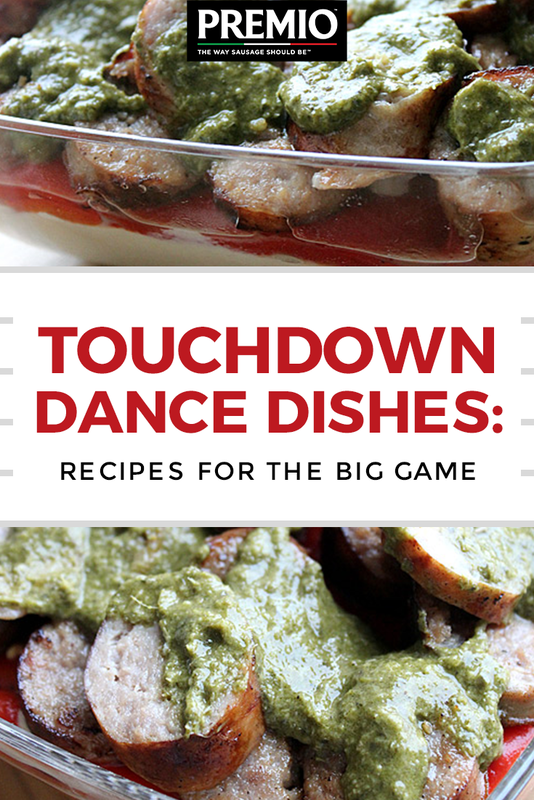 Serve with dipping chips to get you warmed up for the game. When the action picks up around half-time, you’ll want a more substantial dish to dig your fork into. If you love pasta, this Italian sausage recipe is just right for you. First, preheat your oven to 300°F. In a large bowl, combine eggs, cottage cheese, ricotta cheese and 1 cup mozzarella and mix with a pinch of salt and pepper. Meanwhile, saute garlic and onion in olive oil over medium heat. Slice your sweet and hot Italian sausage links into chunks, then add them to the garlic and onions and brown in the skillet until fully cooked. Add your tomato sauce to the mixture. While sausage cooks, bring the manicotti to a boil in a large pot of water until al dente. Place your cheese mixture in a plastic freezer baggie and cut off one corner to make a piping bag, then fill each manicotti with cheese. Spread a layer of sauce on the bottom of a casserole dish and lay out manicotti, then cover with the rest of your sauce and sausage mixture, top with remaining mozzarella and bake for half an hour until bubbly. Let cool and serve. Nothing makes a better gameday snack than finger food, and these quesadillas are exactly what anxious hands will be reaching for while the game unfolds. Fully cook your sausage by grilling or broiling, then slice into coins. Lay out four tortillas and arrange sausage slices on them evenly, then top each with a quarter of your marinara sauce, asiago cheese and mozzarella cheese. Sprinkle with 1/2 tsp Italian seasoning and top with the other four tortillas. In a skillet or grill, carefully cook each quesadilla until lightly browned, using two spatulas to flip them for even cooking. Slice into quarters and serve. Looking for a hearty meal to give you hope for your team? Try this delicious deep-dish savory pie. Start by preheating your oven to 350°F. In a large pan, combine your sausage with oil or butter and saute until fully cooked and browned. Add water, garlic, tomatoes, carrots, celery, corn and peas and cook for five minutes, stirring occasionally to mix. Pour your sausage and vegetable mixture into a deep-bottom baking dish and cover with your crust, slicing small air vents into the dough to let the vegetables steam. Cook until the crust becomes golden and slightly crisp, then let cool and serve for a hearty Super Bowl supper. Ready for the big game? When you’re looking for mouthwatering recipes for the Super Bowl and other special occasions, Premio has the best Italian sausage recipes and delicious sausage varieties to keep you satisfied. Explore everything we have to offer online today, and be sure to search for our sausage in a store near you.